I have done a lot of research on my car. I try to ensure that the information that I provide to people is accurate. There has been some confusion for me on these Pace Cars, as I have always been told that my car was one of two Pace Cars used in the running of the 2000 DAYTONA 500. This has been told to me in phone conversations, and a Letter of Authenticity from GM Marketing Manager RJ Chew, and was recently confirmed by Jim Mattison from Pontiac Historic Services. This led me to believe that there were only two cars. I no longer believe that to be the case. Now, I believe there were TWO CARS USED IN THE RACE, but there WERE ALSO TWO DISPLAY CARS, cars which were fully built up as Pace Cars, but they were only used for dispaly. These cars toured the country in a PONTIAC MOTORSPORTS display. I have looked at many pictures on the internet of these Pace Cars. I have become very familiar with the graphics on these cars, and I am familiar with what makes my car unique. My car was used in the race, of that I have no doubt. After the race, it was put on display at DAYTONA USA, where it was used to promote the 2000 PEPSI 400, and the 2001 DAYTONA 500. It also was used to provide rides around the track during the entire 2000 season and some of the 2001 season, as DAYTONA kept the car for its use until June 2001. So it was there and used as a PACE CAR in the FIRST RACE OF THE MILLENNIUM, and it was still being used by DAYTONA as a promotional car for the 2001 DAYTONA 500 in which Dale Earnhardt was lost. I have a series of photos of the car that backs up the DOCUMENTATION I have outlining its history. One of the clearest pictures I have of the car in race day configuration is on Page 71 of the 2001 DAYTONA 500 program. It is over a half-page in size, and shows my car on the track. It is captioned as THE PACE CAR ROLLS OUT TO START THE 2000 DAYTONA 500. I can CLEARLY tell this is my car, as the clear view of the graphics shows the NASCAR WINSTON CUP SERIES SWOOSH STYLE logo, and the WHELEN logo is a bit crooked, and the stripes and diamonds line up perfectly with my car. The diamonds that flow into the front of the drivers side door go further into the door than other car pics I have seen. I have been lucky in that my car was on display for a year at DAYTONA USA, so many vacationers have taken pictures of my car, and some of these pictures have been found on the internet. I found a few pictures on the internet of my car on display at DAYTONA USA, with the door graphics in the race day configuration. I also have a picture of the car in the infield, parked next to some track vehicles. I have a picture I found on the web of my car on display later at DAYTONA USA with the door text changed to that of the 2000 PEPSI 400. The remaining graphics lead me to believe that this is still my car. Then I have a picture of my car again, but with the door text changed to the logos for the 2001 DAYTONA 500. The words GRAND PRIX on the doors were still blue, as they were in the race. Then I have another picture that was taken in August 2001 with my car on display in front of DAYTONA USA, and it still has the 2001 DAYTONA 500 logos, but the words GRAND PRIX on the doors havebeen changed to red, WHICH IS HOW THE CAR REMAINS TODAY. Timothy Stamper had this picture taken on his honeymoon, so the date was really easy to document as correct. (I believe they may have changed the GRAND PRIX to red because there are small red streaks in the 2001 DAYTONA 500 logo, and it compliments those streaks really well). SO I always wondered about the other car, as I thought there was only one other car. Well, I did find some pictures. But something wasn't right. When I talk about the cars now, I will be referring to several things. First of all, there is a NASCAR WINSTON CUP SERIES LOGO on the cars just ahead of the front wheels. NASCAR had different style designs for the NWCS logos, and it seems that two different designs were used on these PACE CARS. A picture of the Pace Cars leading the race cars CLEARLY shows the lead Pace Car with the SWOOSH logo. I saw pictures of a car on display at a Pontiac dealer in June 2000. It was nearly identical to mine, EXCEPT for a few things. It had the classic NWCS logos. It had no "NASCAR 2000" STICKERS on the back side windows. I then saw a picture of a 2000 DAYTONA 500 Pace Car on display at the Grand Prix Gathering in Kansas City MO in September 2001. I am sure that this is not my car as well, but it did have the SWOOSH logos. This is a picture of a car on display at SHERWOOD PONTIAC in SHERWOOD AL. This picture was taken in June 2000. Notice the straight NASCAR WINSTON CUP SERIES logos ahead of the front wheels. Also, there are no NASCAR 2000 stickers on the back side windows. SEPTEMBER 2001. GRAND PRIX GATEHRING IN KANSAS CITY, MO. 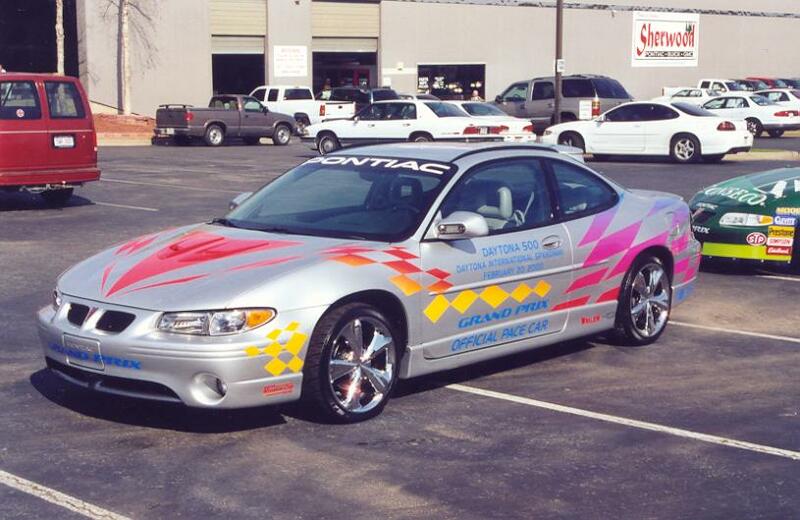 This is a picture of one of the PACE CARS taken in SEPT 2001 at the GRAND PRIX GATHERING in Kansas City, MO. This picture was taken by an unknown member of the MICHIGAN GRAND PRIX CLUB. This car has the SWOOSH style NASCAR WINSTON CUP SERIES logos just ahead of the front wheels. The wheels on this car are the 16" FACTORY DAYTONA 500 PACE CAR EDITION wheels, as the 18" Concept Neeper SHADOW wheels used on the Pace Cars are removed prior to any cars being sold to the public. Most of the NEEPER shadow wheels were switched over to the 2001 Pace Cars. This is the picture that made me think there may be more than two cars. I know for a fact that BOTH CARS USED IN THE RACE had the SWOOSH logos, and the NASCAR 2000 STICKERS on the back side windows. I know for sure it was a NASCAR RULE that every NASCAR RACE CAR and every operational PACE CAR HAD TO HAVE THE "NASCAR 2000" sticker prominantly dispalyed. The race cars had the sticker on the A pillar, the Grand Prix Pace Cars had the sticker on the back side windows, and the Monte Carlo Pace Cars had it on the sheetmetal behind the back side windows. I also believe (but am not 100% sure) that the rules required the NASCAR WINSTON CUP SERIES SWOOSH style logo, as I have seen that logo on every race car and pace car picture I have seen of cars IN THE 2000 DAYTONA 500. I know NASCAR had what they called CONTINGENCY stickers (meaning every car had to have them) and I know for sure the NASCAR 2000 sticker was a CONTINGENCY sticker, and I have seen the NASCAR WINSTON CUP SERIES SWOOSH logo stickers called CONTINGENCY stickers as well, though not directly from NASCAR. Other CONTINGENCY stickers for the race cars included GOODYEAR stickers, UNION 76 stickers, etc. February 2000 Race Day with the NASCAR WINSTON CUP SERIES SWOOSH style logos, and the DAYTONA 500 text on the doors. June 2000 Straight style NASCAR WINSTON CUP SERIES logos, as shown at the SHERWOOD PONTIAC display. September 2001 SWOOSH style logo at the Grand Prix Gathering in Kansas City, MO. Fall 2005 Car sold on ebay with the STRAIGHT logo again. It did not make sense to me that if there were ONLY TWO CARS, then the other car would have had the SWOOSH logo in the race; the STRAIGHT logo in June, 2001; then the SWOOSH logo again in Sept 2001; and finally BACK to the straight logo presently. I can't even imagine someone changing that logo once, let alone three times back and forth! Not only that, but the door logo would have had to have been changed from the 2000 DAYTONA 500 text, to the 2000 DAYTONA 500 GRAPHICAL logo (on the GPG 2001 car), then back to the 2000 DAYTONA 500 text. Also, if you look closely, you can see other differences. The diamonds on the cars ahead of the front wheels line up differently. On the GPG 2001 car, the yellow diamond closest to the front of the car has its left tip ABOVE the top crease (notice the creases in the bumper of the car). The diamond to the right of that has the left tip RIGHT ON the top crease. The SHERWOOD PONTIAC dispaly car has the diamonds a little lower. The front diamond has the left tip RIGHT ON (not above) the top crease, and the 2nd diamond has the left tip BETWEEN the two creases (not on the top crease). The angle of the pictures makes it to hard to notice any little differences in the other stripes. So I was pretty convinced then that there were more than two cars. Well, the ebay car did not sell the first time, so it came up again, with a LETTER FROM PONTIAC HISTORIC SERVICES saying there were FOUR CARS. TWO display cars, and TWO CARS USED IN THE RACE. The letter only says that that particular car is one of the four total cars. Jim Smith of Northern Wisconsin bought that car that was for sale on ebay. It looks exaclty like the car that was on display at SHERWOOD PONTIAC pictured above. SO NOW WE ASK... WHO HAS THE OTHER CARS? We are just really curious about who has the other cars. These cars are a very UNIQUE part of NASCAR HISTORY. On February 17, 2001 DALE EARNHARDT SR gave TERRY BRADSHAW a ride around the track in a 2001 Grand Prix Pace Car. I have read newspaper articles (Tony Brolick - Atlanta) that stated that Dale Earnhardt gave Terry Bradshaw a ride in one car, and then hopped in a second Pace Car for a solo ride around the track. The article stated that it was another Grand Prix. The original car dealer that ended up selling my car stated that my car WAS THE OTHER CAR. This was also stated to Scott Sears, PRESIDENT of the Chicago Grand Prix Club, and others that are in the Pontiac show scene. I know my GRAND PRIX PACE CAR WAS AT THE TRACK at the time, and was one used by the track for giving rides and other duties. This would be really interesting to confirm, as it would mean that my car was ONE OF THE LAST CARS (if not THE LAST CAR) that DALE EARNHARDT EVER DROVE, besides the car he crashed in the next day. There was a center console cover stashed in the trunk of the car that has Dale Earnhardts signature as well (This is also cool, as I got Dale Jarrett to sign the passenger airbag cover in July 2005. I have photos of him in the car signing it). We are also looking for pictures of the Pace Cars at the track, and at DAYTONA USA. Track cars, display cars, anything. We want pictures. Pictures, video, anything.